Making sure your pearly whites are perfect for your wedding should be a top priority given your photo will be taken all day long. There to provide you top quality service as an Invisalign GOLD+ and Propel Orthodontics provider is Dentisterie VMR in Montreal. Whether you’ve had braces or not, the doctors at Dentisterie VMR will ensure your smile is wedding ready. Invisalign clear aligners use the most advanced technology to straighten your teeth and give you your best smile. Using a series of aligners made with advances such as proprietary SmartTrack material, Invisalign treatment can straighten with 75% more predictability. Worn for approximately 20 to 22 hours per day, Invisalign aligners offer you the flexibility of removal (unlike braces) to eat and drink what you want, when you want. The best part? Your lifestyle isn’t interrupted, meaning you can still enjoy the activities you love and the foods you can’t live without. All with no unexpected trips to the doctor due to broken wires or brackets. Your doctor will complete a scan or impression. Together with the team of specialists, Dentisterie VMR will craft a complete digital treatment plan, mapping out your best smile from beginning to end. Invisalign clear aligners are designed to transform your smile up to 2X faster and are made with unique advances, such as SmartTrack material. Each aligner throughout your treatment gradually and predictably moves your teeth as you continue to live your life the way you want. After approximately two weeks, you will begin using the next set of aligners, which will continue the teeth straightening process. Throughout your Invisalign treatment, you’ll see your smile transform, gradually revealing the person you’ve always imagined yourself to be. With the help of Invisalign clear aligners and your experienced doctor at Dentisterie VMR, you’ll discover how a series of small, expertly designed shifts can shape a whole new smile. Save up to $1,320 on your Invisalign treatment! Offer ends December 1st 2018 (limited seats)! 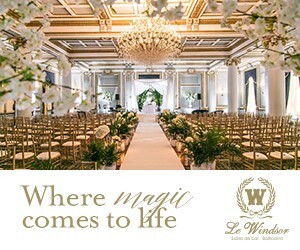 Browse our wedding vendor list!